When did you first visit a public library? What role have public libraries played in your life? What roles will they play in our “digital age”? 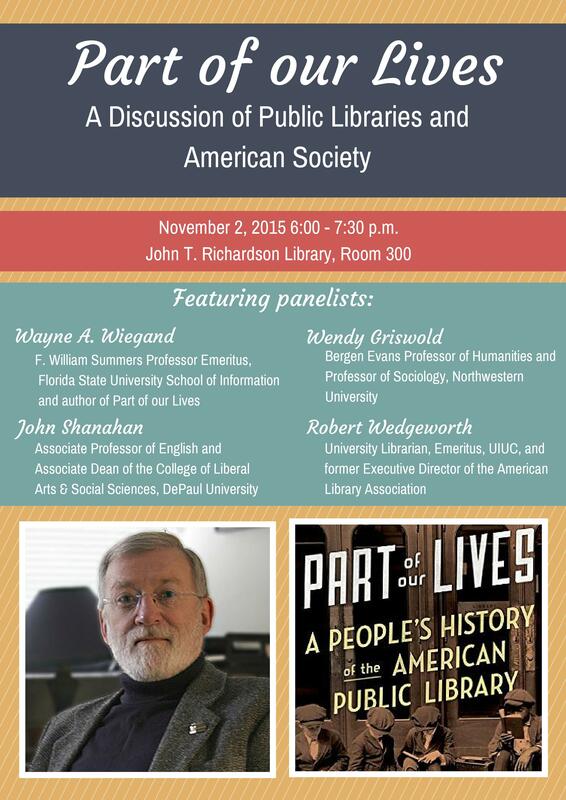 Join the DePaul University Library and the DePaul Humanities Center on November 2, 2015, for a panel discussion of the role of the public library in American society centered around the recently-published Part of our Lives: A People’s History of the American Public Library (2015). Wayne A. Wiegand, F. William Summers Professor Emeritus at the Florida State University School of Information, and author of Part of our Lives, will discuss the enduring role of the public library in the United States, and will be joined by a distinguished panel of colleagues, including Wendy Griswold (Bergen Evans Professor of Humanities and Professor of Sociology, Northwestern University), John Shanahan (Associate Professor of English and Associate Dean of the College of Liberal Arts & Social Sciences, DePaul University), and Robert Wedgeworth (University Librarian, Emeritus, at the University of Illinois at Urbana-Champaign, and former Executive Director of the American Library Association). Recent research has suggested that the public library is “at a crossroads” in its development as a social institution as technology continues to re-shape our experience of reading and community, and Chicago has been at the center of this discussion with the ongoing commitment of the Chicago Public Library to programs such as YouMedia, Maker Labs, and One Book One Chicago. 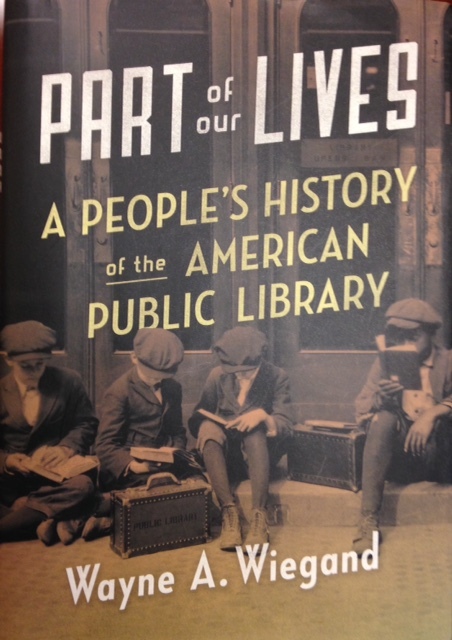 As Wiegand writes, the public library has “a rich history of meaning for millions of Americans,” both as civic institutions and as spaces for promoting and maintaining community, and we hope you can join us for a discussion of what the library means for you, for DePaul, and for Chicago. 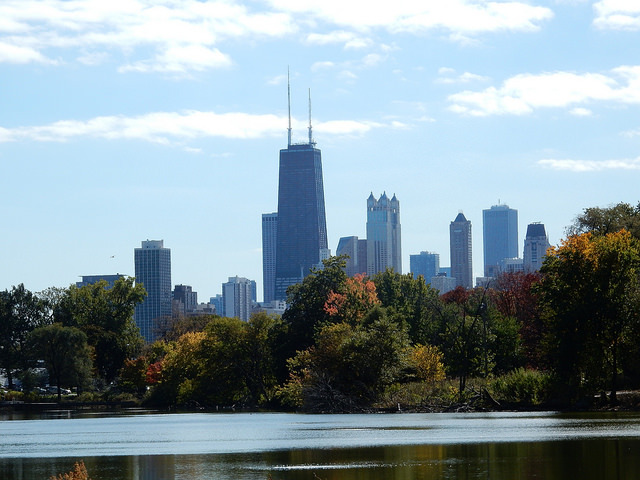 “Part of our Lives”: A Discussion of Public Libraries and American Society will take place in Room 300 of the John T. Richardson Library on DePaul University’s Lincoln Park Campus from 6:00 – 7:30 pm on Monday, November 2nd.